Select the membership type that is right for you! 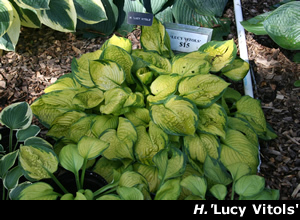 Join the American Hosta Society and receive The Hosta Journal mailed twice a year and have access to a third issue online in the Members Only section of the AHS website. This publication offers the latest information on care, feeding, and hybridizing; pictures of new cultivars; and news of upcoming meetings and conventions. An opportunity to attend national meetings and conventions which offer educational and scientific presentations, garden tours, judge's clinics, and a chance to see the latest and best hosta in the cut-leaf show. The privilege of visiting display gardens throughout the country, many of which are only open to AHS members. An invitation to exhibit your favorite hostas and compete for recognition in various AHS national and regional cut-leaf shows. Developing friendships with people that share an interest in growing hostas. Effective midnight EDT on August 31, 2018, all new and renewal membership registrations will be assigned to calendar year 2019. No 2018 memberships will be available after August 31, 2018. Individuals who join/renew after that time will receive the regular welcome letter advising them of the effective date of their membership (but providing them with the 2018 password) as well as a copy of The Hosta Adventure. In order to attempt to reduce the current practice of late renewals and offset the cost of mailings to late renewals, a $5.00 fee will be added to all membership renewals postmarked or paid online after midnight EST on March 17, 2019. Click here to return to the AHS Home Page!